A powerful working man’s real Bourbon blend with fast-pitch flavor. Cooperstown is home to the baseball hall of fame. So what do you do if you are opening a small-batch craft distillery and spirit blending house in Cooperstown? Gene Marra founded Cooperstown Distillery to marry his twin passions of baseball and fine spirits. Today, they make BeanBall Bourbon, Abner Doubleday Classic American Whiskey, and DoublePlay Vodka. The also produce Glimmerglass Vodka (named after a local art festival), Fenimore Gin (named after a Cooperstown Art Museum), and a bunch of other spirits named after baseball lore and local Cooperstown attractions. The bean-ball is a fearsome pitch thrown to teach the batter a lesson. Cooperstown Distillery BeanBall Bourbon is a 90-proof shot of liquid Americana in a glass. Get yourself a bottle of this working-man’s drink, a couple of hot dogs, and a box of Cracker Jacks. Boom… you’ve just learned how to hit a home-run in the game of life. Cooperstown Distillery Bean Ball Bourbon is actually a combination of their small batch Bourbon and Indiana Bourbon, and the combo is a line-drive home run. 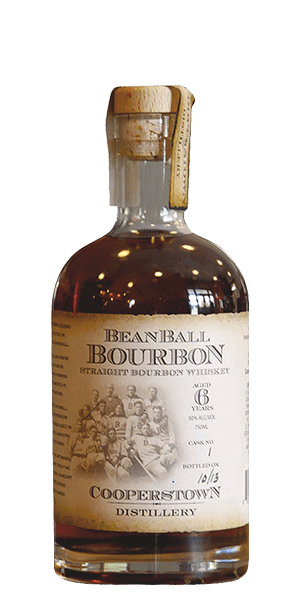 What does Beanball 6 Year Old Bourbon taste like? The Flavor Spiral™ shows the most common flavors that you'll taste in Beanball 6 Year Old Bourbon and gives you a chance to have a taste of it before actually tasting it. The nose fills with earthy notes of caramel and toasted grains. On the palate, you’ll be greeted with the flavors of warm oatmeal, oak, sweet corn, and pumpkin pie. The finish is medium to long and lingers with toasted bread and mint. For something I randomly selected, I was pleasantly surprised. It’s a smooth bourbon, but not something I would drink all the time. It has slight hints of sweetness that I’m not real crazy about. Definitely worth a try though. There's nothing particularly bad about this bourbon, but also nothing that stands out. Imagine yourself watching a baseball game on a Sunday morning and the whole experience comes together for you. Very smooth and light. Very smooth and easy to drink. Enjoying it greatly. I joined Flaviar hoping to find micro distillery bourbons like this one. This bourbon will be a regular for me.